Also, this weekend, Maureen Ryan will post an interview with writer of "The Oath" Mark Verheiden. TV Guide just posted Part 3 of their great video interview with Olmos and McDonnell. Love. Enjoy. Two more good interviews are available with Ron Moore this week: he talks with Geek Monthly Magazine in their February issue about BSG, DEEP SPACE NINE, CAPRICA and VIRTUALITY, as well as the changing face of sci-fi television. You can see a sample of the interview here. Several of the more, um, critical fanboys who hang over at the SciFi.com BSG forum and GalacticaBS somehow managed to corral Moore into an interview for MediaBlvd, with some very entertaining results. I guess this second interview should have a mild spoiler warning on it. Moore says some very interesting things about several key characters. Interesting…yet vague. Meanwhile as you’ve all probably noticed by now, Moore’s new THING prequel/sequel film has a director. Some are happy about this…some, not so much. 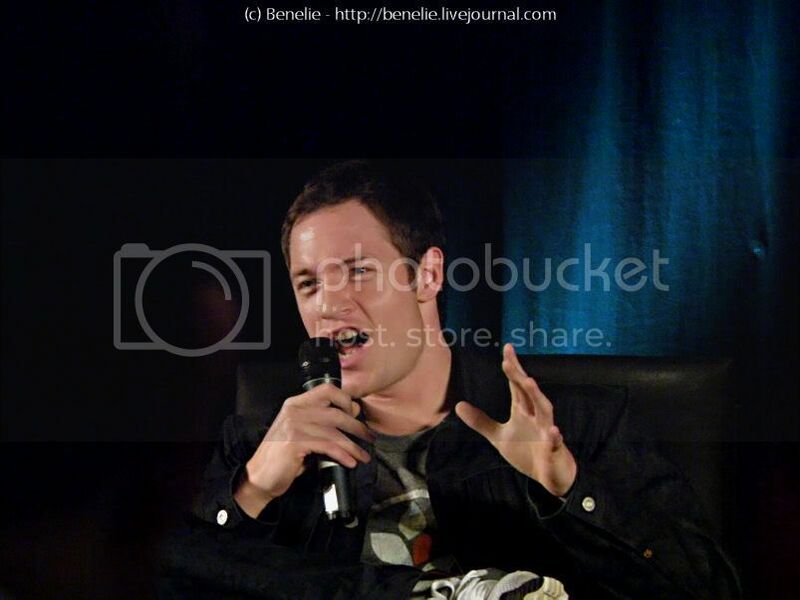 For those of us who can never make it over to the UK for Sean Harry's fantastic Starfury cons, a fan known as hobbitofkobol has done us a lovely favor and transcribed the sessions at last month's Q&A sessions with Tahmoh Penikett, Nicki Clyne, Jennifer Halley, Michelle Forbes, Katee Sackhoff, James Callis and Mark Sheppard. 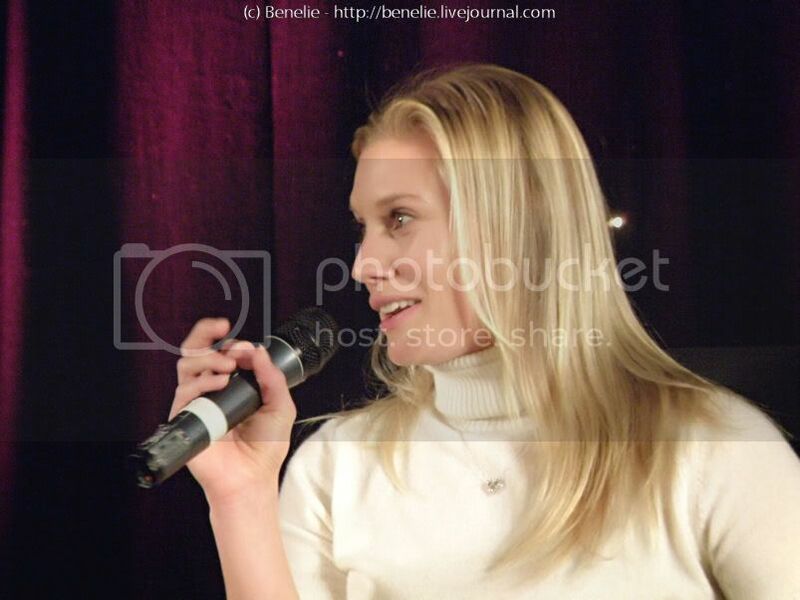 Terrific photos (some of which we've borrowed here) provided by fan benelie. BRAVO. By the by if you are in the neighborhood and can get to one of Starfury's events, every fan I've talked to about these cons just loves them. The next BSG one is Mission Starfury in November 2009. Go if you can! There are some BSG-related events on the books: a ton of BSG comic book related panels; Tahmoh Penikett at a DOLLHOUSE panel with Joss Whedon where they will screen part of the first episode and giveaway some posters; Mark Sheppard at the SEGA booth promoting THE CONDUIT; there is a panel about the web series EMMISARY, which co-stars Aaron Douglas. SuperBSGfan Seth Green and his ROBOT CHICKEN posse are doing a panel as well. Last year's RC panel was the best thing I saw at NYCC last year other than the all-cylon BSG panel, make sure to be there if you’re attending! Last week's episode was about philosophy. This one's about practicality. Where most of "Sometimes a Great Notion" was spent on the characters -- and the audience -- trying to make sense of the ruined state of Earth and one mind-bending revelation after another, "A Disquiet Follows My Soul" features the rag-tag fleet attempting to get back to business. There will be time for soul-searching, and for answers, later, but right now, everyone needs to figure out what to do now that Earth has turned out to be an even bigger dump than New Caprica. I suspect this was ultimately a “setting things in motion” episode, where we got to see the beginnings of many plots that will carry through to the end of the season and series, but it was an elegantly constructed one all around and a fine directorial debut for Moore. Daniel Fienberg writes: "Is this the calm before the storm? Well judging by the preview for next week's episode it sure looks like it." Wow. I just sat stunned through most of this episode. The intensity kept building and building and I couldn’t believe when it was over: it seemed to zip by. And then after all the awfulness, to end on that aww-sweet moment with Bill and Laura... that was almost like another punch in the gut, this tiny bit of happiness after all the bad stuff. And I guess it’s like a punch in the gut because we know it can truly be only a tiny bit of happiness for Bill and Laura. Yes, it's time for one of those episodes where the space battles (and effects budget) take a back seat to the human (and Cylon) drama; the disquiet before the storm, perhaps? Not that the episode passed without incident. Lee accidentally let the press know that the Final Cylon is a woman. Caprica Six and Tigh's all-Cylon baby is fine. Gaeta's harbouring a serious grudge. Chief punched out Hot Dog. Not much more was revealed about the Cylons that were found on the burnt-out Earth last week, or indeed about the nature of the Final Five, but maybe they felt like we'd had enough to digest already? This episode was written by Ron Moore, who also made his directorial debut. While not among the strongest installments Moore has written, there were plenty of notable moments – from the casual way we found out that yes, Adama and Roslin are now sleeping together (finally! ); to a small moment like Adama pausing to pick up some trash in a Galactica corridor, wanting to keep his ship together as chaos threatens to take over. And on a show known for being extremely dark, there also were a couple of very funny moments this time – one during the scene in which Tyrol kept getting confused over how to refer to Cylons and if he should use "our" or "their"; the other during an otherwise grim scene showing Baltar's acolytes also getting worked up and angry, when Baltar told them they were not children, and then had to stop and point out to the little boy sitting in the front, that okay, he was a child. Other reviews and recaps from: Zap2It, BeliefNet, DigitalSpy, North By Northwestern, TV Squad, TV Fodder, BuddyTV, Mania.com, Tim Goodman, and NY1. Buddy TV wonders where the show goes from here, and Geeksugar has a recap quiz. “Prelude” is based on my scores for Battlestar Galactica, incorporating music from all four seasons. The orchestra will be in the pit, but the taiko drums will share the stage with the dancers, incorporating their movements and energy into the visual performance. This ballet tells no specific narrative, but rather allows the dancers, lights, taiko drum ensemble and full orchestra to come together and support the story within the music itself. The Fresno Bee and Sci-Fi Wire talked with Ron Moore and Kate Vernon. San Mateo native Michael Trucco spent lunchtime Tuesday with the Battlestar Galactica class at Crystal Springs Uplands School. Yes, the handsome movie and small screen star is a hometown boy. Yes, Crystal Springs Uplands has a special elective class devoted to studying the sci-fi drama. And yes, there is plenty to learn about history, psychology and sociology from Battlestar Galactica. Kandyse McClure talks about Children of the Corn to Sci-Fi Wire. At the Phoenix Comicon Aaron Douglas hung out with Wil Wheaton. DVICE and ScreenRant ask, Enterprise vs. Galactica: Who Would Win? Take a look at the single largest gathering of Battlestar Galactica in Lego. 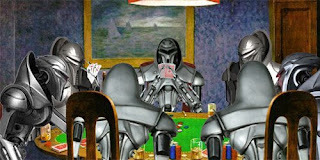 Rob Loftis reviews the book, Cylons in America. An article from George Reisch adapted from “I am a Cylon,” by Richard Hanley in Battlestar Galactica: Mission Accomplished or Mission Frakked Up?, finds a way to compare Battlestar Galactica, and Bernard Madoff. 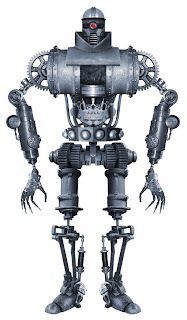 DVICE is having a Design a Steampunk Cylon Contest. Not just any Cylon: one that might have existed in an era of steampunk. You know, a Charles Babbage, Jules Verne, pneumatic brass and crystal Cylon! Just a reminder to all you Portland, OR fans, that Mark Verheiden is apparently coming to this Friday's Cort & Fratboy Frak Party at the Bagdad Theater to watch his final episode, "The Oath," with you frakkers and do a post-show Q&A. Lucky you! Let us know how it goes. So hurry up if you're interested. OMG no, not Lee! Noooooooo! The "enhanced" episode with commentary is on Hulu and SciFi.com, and the commentary podcast is now up on iTunes and the SciFi.com RSS page. 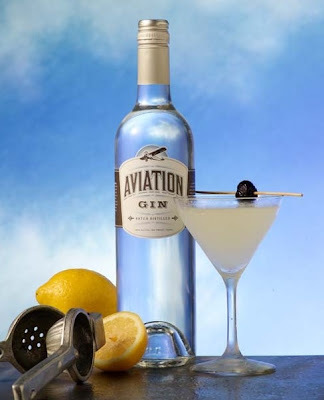 I don't know if it was the gin and tonics, or "MrsRon's" presence, or all the discussion of sandwiches and the BSG Auction...but this was one of my favorite podcasts in quite some time. Two things one might consider newsworthy in the 414 podcast: Moore bought Baltar's cigarette case from the auction; Terry Moore seemed to indicate that Moore will be directing again quite soon. Also on iTunes this week: Celebrity Playlists from Jamie Bamber, Katee Sackhoff, and Michael Trucco. [HT to bsg blog] ...OT: For you LOSTies in the house, they also posted lists from Michael Emerson, Evangeline Lilly, Naveen Andrews. Mo Ryan, bless her heart, has another interview with Ron Moore discussing this week's show. Bear McCreary has posted his weekly exploration of the music for this week's ep, and includes comments from Ron Moore, Richard Hatch, and Alessandro Juliani. Bear also mentions a portion of the Baltar prayer meeting sequence that was cut from the version we saw on air. 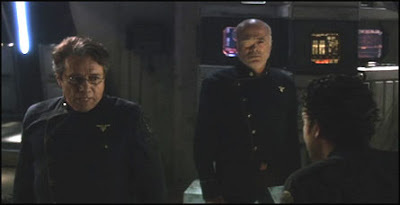 This is just another frakkin great interview with Michael Hogan. And here's another. The "Battlestar Galactica" prequel "Caprica" will have some familiar names among the credits when it debuts next year on Sci Fi. Jane Espenson, co-executive producer of “Battlestar Galactica,” will have that title on “Caprica” and will eventually become “Caprica’s” showrunner. ...Ron Moore said he’d be running the writers’ room when it first convenes in early February, but he added that at some point, he’d be handing over those day-to-day showrunner duties to Espenson, who will take on the title executive producer midway through the season. ...Espenson said that "Battlestar" writers Michael Taylor and Ryan Mottesheard would also be joining the "Caprica" staff. On Jan. 16, the day "Battlestar" returned with the first of its final 10 episodes, Galactica Sitrep reported that "Battlestar's" composer, Bear McCreary, as well as its production designer, Richard Hudolin, and special effects supervisor, Gary Hutzel, would also be working on "Caprica." Alrighty, dear readers...let's talk new BSG tonight. Unfortunately I (ProgGrrl) won't be back from my frak party till later tonight...Logan, are you out there? It's a character piece. It's a smaller show; I designed it deliberately to be that way. I wanted to take a breath after the events, the shocking events, of the past couple of episodes. Things were happening huge. Revelations were coming one on top of another. And now I wanted to do a smaller piece that was just about people on the ship and where they are in their lives before the next giant arc just sort of pulls them along into even bigger events. Also note that another Propworx eBay auction is live this weekend, containing items that were on the show last week and tonight, and some other older stuff as well (Socrata Thrace photos!). Frakkin fun. ETA: io9 has transcribed all bits of The Cylon Bible that appeared onscreen in this video. Sci-Fi Wire: What can you tell us about the episode? What kind of story is it? Moore: It's a character piece. It's a smaller show; I designed it deliberately to be that way. 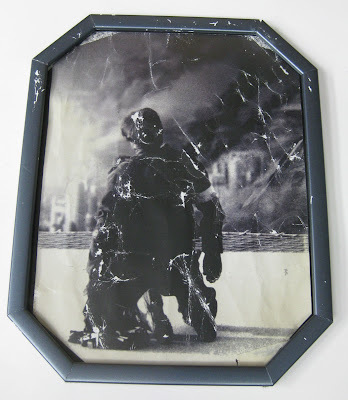 I wanted to take a breath after the events, the shocking events, of the past couple of episodes. Things were happening huge. Revelations were coming one on top of another. And now I wanted to do a smaller piece that was just about people on the ship and where they are in their lives before the next giant arc just sort of pulls them along into even bigger events. Sci-Fi Wire: What's happening with Caprica? Moore: Caprica is getting underway. We're putting the writers' room together as we speak. It's very exciting. It's a very different challenge. It's a very different show. I think there's a sense of "Well, Battlestar has set a very high bar." That makes everybody have to bring their A-game, and I think that's the spirit in which we're approaching Caprica. Sci-Fi Wire: Knowing that you had Caprica on the horizon, did you hold back at all on wrapping up the Cylon mythology in Battlestar Galactica in order to give fans an incentive to tune into the new show? Or does Battlestar Galactica settle it for everyone? Moore: Galactica is going to pretty much settle it. Caprica will be about how the people on the colonies developed the Cylons. And that has its own story to tell about how that came about. But in terms of the larger mysteries and mythologies and hows and the whys and how everything lays out on Galactica, we set out to answer as many of the questions that we could by the end of the show, and that's what we did. We didn't hold anything in reserve and say, "Oh, well, we'll deal with this over in Caprica." Matt and Nat of the BSG Cast review Sometimes A Great Notion, and Nat talked with Battlestar Galactica's costume designer, Glenne Campbell in Pasadena at the site of the prop and costume auction. 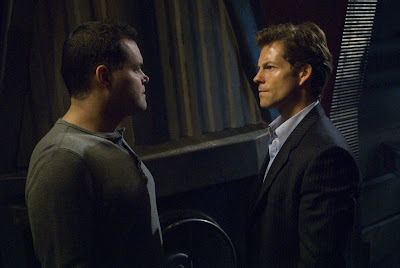 Jamie Bamber spoke to TV Guide about working on the final episodes of BSG and what it was like to say goodbye to the show. Sci-Fi Wire talked to Kandyse McClure about her arrival at closure for her work on Battlestar Galactica. Bryan Lambert shares his thoughts on Dirk Benedict. BSG effects artist Mojo about working on BSG for the last time. See also, a slew of science fiction links. As much as I love to speculate on the nature of the Cylons, the prophecies, the opera house and all the other stuff that Ron Moore promised he'd get back to, what really grabs me about the show (as I discussed in today's column) is its humanity, the way its characters react to situations the way you imagine real, contemporary people might. How would you react if you had been living a horrific existence for years on end, and the only thing keeping you going is the hope of one day finding this wonderful place called Earth -- and then that hope gets taken away when Earth turns out to be ruined? I like to think I can handle myself well in a crisis, but I could very easily see myself committing suicide like Dualla, or curling into a fetal position like Roslin, or getting drunk and trying for a suicide-by-Cylon-cop like Adama. This is a brutal, brutal development on what wasn't the happiest show to begin with, and I'm glad team "Galactica" (led here by writers David Weddle and Bradley Thompson and director Michael Nankin) didn't flinch from that. What's really surprising about this episode is that there are some huge revelations in it – by the end of the first half, some amazing things have been revealed that completely uproot the backstory on the series. On the heels of the discovery of Earth happening with ten episodes still to go, perhaps I shouldn't have been so surprised, but it's really amazing and impressive to realize there are still several episodes to go and we're learning the things we are already. Not to say these revelations close doors – instead, they raise some major new questions to mull over as we head into the home stretch of this wonderful series. The biggest question this season is going to face will be how they can produce an ending for this show that works. The way that Earth was suddenly no longer the panacea they were hoping for felt a little like a bait and switch tactic, but the explanation was so great, it doesn’t matter. There are a lot of unresolved issues to work through in the final nine episode, so either way, the ride should be worth it. Sometimes, you just have to take a step back and say, "Everything's going to be alright." Well, unless you're a character on Battlestar Galactica. Then you're pretty much hosed. Oh, man, I am still trying to get my head around this one. Talk about bombs dropping... Ellen. Dualla. Starbuck. The distant pasts of the final four. I barely know where to begin even thinking about it, never mind writing about it. And I can’t not think about it. It’s not like you can just sit there and tell yourself, “Well, I’ll simply wait to see how things develop over the next nine episodes. I don’t need to turn it all over in my head and wonder about how things will turn out. The episodes are completed, everything is set in stone, it’s all a done deal. It’s merely that I don’t yet know what the deal is that’s been done, but all I need is to be patient and hang on from week to week.” No: you can’t not think about this. Things couldn't be looking worse for the weary refugees in episode one of the final ten. They traveled across an entire galaxy only to find that Earth was destroyed in a nuclear attack almost 2000 years ago and remains completely unihabitable. The opening episode shows the leaders of the scrappy survivors starting to completely lose their minds as they realize that the original inhabitants of Earth were apparently cylons. With all hopes of reuniting with the rest of their species dashed, the crew spirals into depression, mania, desperation and a whole lot of suicide. The proper response to even devastating tragedy is not the seductive embrace of death and its incomprehensible oblivion, but rather perseverance even when it seems all hope is lost. The appeal of immortality lies not in continuously experiencing the pain and disappointment of life, but in looking forward and having the time to eventually create a situation that allows for a thriving life filled not with sorrow but with the things we cherish. A better place may be a long away for the Colonials, but by clinging to life it’s nonetheless a possibility for them. Adama’s Cylon allies would seem to prefer a mortal life to an immortal one, but at least the mortal Adama has the wisdom to cling to life in the hope of a better future even when life is at its worst. Poor Roslin. Last night, she finally had the breakdown that she has never allowed herself to have, going back to the initial attack, because she was immediately thrust into the role of president and had to focus all her energy on keeping morale up, giving the people hope, keeping the comforting wheels of government bureaucracy turning. She never got to grieve for all the things she lost, or mourn her murdered loved ones, because she had to heal everyone else’s grief by giving them something to believe in. Something called Earth. Now that Earth has been reached, and instead of the answer to their prayers it turns out to be one more horrific nightmare, she is confronted once more by The People, demanding that she make everything okay, and she breaks. Finally, the superhuman mask of The President cracks, and she let’s herself feel all the pain and bewilderment she could never afford before. Andy Grieser of Zap2It and Asma Ahmad in North by Northwestern provide recaps. Other reviews from Galactica Variants, The Young Turks, Examiner.com and Galactica Science has a few interesting observations on Earth. And check out an exclusive set of excellent behind the scenes photos taken by director Michael Nankin during the filming of Sometimes A Great Notion in The L.A. Times. photo by Randee St. Nicholas for the L.A. Times. In The Los Angeles Times Geoff Boucher has an exciting and interesting interview with Kate Vernon. All of this was a tremendous surprise considering Ellen was poisoned to death in Season 3, but with the Cylons, the usual rules of mortality don't apply. Vernon is thrilled to be back. Her character was originally written for a four-episode arc, but she endured and became a key character -- until she was murdered by her on-screen husband. "I wasn't done with the character," Vernon moaned. "They killed me off. I was devastated. Why me? What did I do wrong?" A small reprieve came when executive producer Ron Moore told her she would return as a dark vision of her husband's tortured mind, but Vernon resigned herself to the fact that her role in "one of the greatest shows ever made" was over. Then, on an especially wrenching afternoon many months ago, she got a phone call. "I was crawling down Sepulveda and I had just come from a therapy session and I was crying, my eyes were swollen like clam eyes, and I was hanging on my steering wheel wondering what was going on in my life and my career. The phone rang. It was Ron's assistant." For the next 45 minutes (traffic was bad) Moore explained that Ellen would return as a centerpiece presence. "Now I'm in seven of the last nine, and they are just absolutely brilliant. I can't tell you how good they are," she said. Kate and Ron also talked to The Deadbolt about how trilled she was to return to BSG for the last episodes. "We really did think about it, but the story was too good to pass up for the few people who would inevitably be mad at us," says TV editor Kate Aurthur. She explained: "Entertainment journalism is a competitive medium, and this was a huge exclusive scoop for us. We took great pains to make sure it didn't export to the Web early by accident, and even held the Web version up so it published after the episode aired Pacific Time (letting our East Coast competitors perhaps get the jump on us, but out of consideration for Sci Fi's wishes and our core readers in California)." As for a reader who sarcastically asked if editors were aware that some readers record shows to watch later, Aurthur responds, "Though we certainly know that many readers have DVRs, we can't hold back on our coverage when something very important happens on a show people love. We must assume that people who care the most watch in real time, or close to it." I have to agree with the Times on this one. This was a major event in the history of the show, so it's logical that it would make big news. My view has always been that once the show airs in the U.S. it's no longer a spoiler, and any embargo on the information can be lifted. At least that's our policy here. There are other sites on the web that specialize in spoilers, and they do a fine job at it. But on Sitrep, after an ep airs, the information is fair game to report and discuss. Grant over at the livejournal Battlestar Blog is spearheading a wonderful fandom thank-you project: you can submit letters of admiration, thank you, or other celebratory greetings -- and it will be collected up into a PDF file that will be distributed to the show's cast and crew. Deadline to submit for the project is SUNDAY, JANUARY 25. That's this Sunday, so hurry up and get over there! Thanks to Grant (and his secret crew contact at Universal) for putting this together, so that fans everywhere can show a little bit more love as the series ends. Sigh. We are once again late to the party on announcing this, but Toronto's Bad Dog Theater Company is once again doing weekly shows of the improv comedy show BATTLEAWESOME AWESOMESTAR this month. Unfortunately all shows are now sold out except the last one on January 31...so hurry up and get your tickets. Wish I could be there...or that they'd take this act on the road! NBCU has released a cheerful press release on the Friday ratings for ep 413. As they should do. Bottom line: a bit better than 4.0 and very popular amongst men who hang at home on Fridays. The first episode of the final batch of "Battlestar" episodes (2.1 million viewers, 1.3 million adults 18-49) matched the Season 4 premiere in viewers and was down just slightly in the adult demo. The network is fortunate that's all it lost. Sci Fi has engaged in a momentum-crushing, yet budget-friendly, release schedule for this relatively pricey series. In an era when serialized shows have proven time and time again to benefit from as few breaks as possible, Sci Fi went the other direction for its final round of "Battlestar," splitting 20 episodes into a two-part season airing about a year apart (meaning the network also has to market the show twice). After DVD sales are factored (look, it's "Battlestar" Season "4.0" ... then "4.5"), it probably all makes sense on paper. But fans get so annoyed by the network's strategy, you have to wonder if it costs Sci Fi in unfactorable ways. The timing is off for posting this vid...but it's so frakkin funny I can't help myself. If loving this is wrong, I don't wanna be right. Regular Sitrep coverage of BSG will resume after the inauguration. Bear McCreary goes into astonishing depth and detail about the score for Sometimes A Great Notion on his blog. It's all a great read, but the story behind Dualla's score is quite noteworthy to learn how Bear incorporated Kandyse McClure's improvised humming into the music throughout the episode when Dualla is on screen. Battlestar Blog found video of a Hollywood 411 piece from the Auction. Melody Muse was blogging the auction here and posted a nice flickr set of her photos from the weekend. BSG Auction from ProgGrrl on Vimeo. In a Raptor at last... from ProgGrrl on Vimeo. I was there. How the frak did that happen? And I got to hang out with this terrific blogger, extra double plus good. Ron Moore and Bradley Thompson praising the entire cast and crew effusively on stage before the screening. A SciFi exec onstage, saying "they're feeling it" for an Emmy this year. Cross your fingers. Bear and Brendan McCreary performing All Along The Watchtower live onstage with a guitar and an accordion. Finally seeing some BSG eps on The Big Screen. The detail. The intensity. Wow. 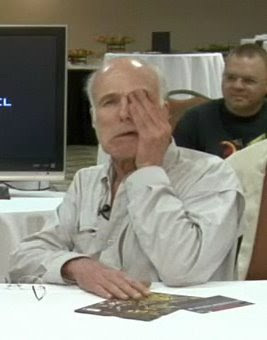 The reaction of the audience to any scene starring Michael Hogan's Incredible Acting Eye. FTW! The reaction of the audience to any of Tory's scenes (lots of boos and hisses, LOL). Knowing, at the end, that we may be seeing a lot more of a certain somebody on the show now. I hope. Meeting Paula Malcomson and Esai Morales and telling them how happy I am about Caprica moving forward. GO TEAM! Standing two feet away from all those memorable props. Getting up close with the CIC set pieces to see how detailed (and beat to hell) they actually are. TV magic at its finest. Finally meeting Joe from the wondrous Battlestar Wiki...and Steve from the very cool site FuturePast... two of the folks that have been working really hard on this auction for months. Hulu and Scifi have ep 413 with Ron Moore's commentary (which you can also download as an audio podcast from iTunes here or from SciFi here). The day the staff finished putting the cards up on the board with Ron, and the day before we began writing, I flashed on my favorite American novel, Sometimes a Great Notion by Ken Kesey. It is a much underappreciated and towering work. Anyone interested in fine literature and great story telling should read Kesey’s masterpiece. In Kesey’s book, the hero --Hank Stamper, an Oregon logger -- does constant battle with the river that runs past his home, a river that has claimed the lives of pets and loved ones and comes to symbolize the vast and indifferent power of the universe that both gives life and cruelly snatches it away again. In his notes to himself as he was writing the book, Kesey scribbled something that has become one of the shorthand phrases Brad and I use while writing scripts. Kesey wrote: “Try to make Hank quit.” By that he meant: take this strong, heroic character and pile one misfortune on his back after another until he finally falls. What happens in that moment? Does he despair? Does he get up and go on? For me, there is no more defining moment for a character. OK folks, here we go with a first for Sitrep this season - we'll put up open threads every Friday for discussion of the episode. Please read our spoiler policy before you post on the threads. All 4.5 open threads will be collected in an index that will sit on our blogroll rightside column, for handy access. (Here's the thread for the webisodes, btw.) If you know of other fun sites or forums that are having lively non-spoilery episode discussions, please feel free to post links here as well. The hiatus is over forever. How are you feeling today? This post is the index for all our Season 4.5 Open Threads. Bear McCreary in studio at a “Caprica” scoring session this week! "It's about a society that's running out of control with a wild-eyed glint in its eye," says "Galactica" mastermind Ron Moore, who penned the "Caprica's" two-hour pilot with Remi Aubuchon. "You can just feel it running out of control, with its youth culture and its moral choices. There's doom in the air, but not doom in terms of the human spirit," Moore says. In short, the show's stories and settings will be more congruent with Earth in the very near future than "BSG" has been. Moore and the Sci Fi Channel are hoping that will help "Caprica's" appeal. "We want people to come to this who've never heard of 'Battlestar Galactica,' " explains Sci Fi prexy Dave Howe, whose network has ordered 20 hours of the new series. "I think there was a barrier to entry for some viewers (for 'Galactica'), since it had the backdrop of space and spaceships." Moore concurs, saying "We had viewers say that if they were able to trick their wives or girlfriends into watching 'Galactica,' they loved it." But with the name "Battlestar Galactica" "screaming science fiction," he adds, "there was just such a high hurdle to get female viewers to even try it." All the videoblogs are here...there was another one posted earlier in the week, but it's not on Hulu. 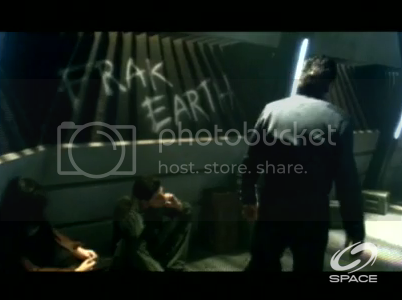 Do you know if the Sci Fi Channel will have the new season of BSG online? -- Liz D.
Yes, and I just got the exact schedule for you: According to a Sci Fi spokesman, for the first five weeks, the Season 4.5 episodes will go on SciFi.com and Hulu at 2 a.m. ET the day after they air. They're also available on iTunes and Amazon beginning at 3 a.m. ET each Saturday, so you really have no excuse to miss 'em! Only the first five weeks...but it's something. Herc of Ain't It Cool News gives "Sometimes A Great Notion" 5 stars, and does so without spoiling the episode, but does provide some interesting teases. Mark A. Perigard of the Boston Herald walks the same line, praising and teasing the episode, without ruining it for us all. Variety has a slew of BSG articles today, including reflections from director of Sometimes A Great Notion, Michael Nankin, and co-writer of the episode, David Weddle. Variety also presents thoughts and observations from friend of the Sitrep, and Daily Show writer Rob Kutner, who imagines a Daily Show in the fleet. Others pondering the meaning of BSG including members of the military, clergy, scientists, a political blogger, and a PBS TV show host all here . Generally Frakking Important: Sitrep has collected a ton of info over here to take the discerning BSG TruFan far into the future. Help Bear Curate the Season 4 CD: Bear McCreary would like all of us to comment here on his blog throughout the final season, and tell him which musical pieces we would most like to see on the Season 4 soundtrack. Pretty cool, eh? Ron Moore podcast commentaries: Hulu and Scifi are posting full episodes with Moore's commentary track overlaid weekly. You can also download as an audio podcast from iTunes here or from SciFi here. SciFi is broadcasting all 10 webisodes tonight (Thursday night) during the airing of the film PITCH BLACK. On Friday beginning at 8:30am ET/ 7:30 CT, they will air an all-day BSG season 4.0 marathon leading up to the premiere. Starting at 10am ET, Space will be running 14 hours of BSG programming this Friday, including all the 4.0 episodes and a “fandom forum” discussion. Sky 2 is running 4.0 eps this week leading up to the 4.5 premiere on Sky One on January 20th. SciFi.com (free): last year, SciFi’s own site posted new episodes 1-3 days after their Friday broadcast, along with “enhanced” versions containing Ron Moore’s commentary tracks. They also streamed the full episodes for the first few weeks starting on Fridays at 9am EST – but there has been no indication that is happening this year. New episodes of BSG return to Hulu 1/17. The first five episodes will be posted on Hulu the day after their TV broadcast. Subsequent episodes will be posted 8 days after their original broadcast date. We are able to offer five older episodes from the previous season; they will be available until 5 a.m. PST on 1/31/09. iTunes: there is already a very nifty BSG home page on the iTunes Store site, which contains pages for each season in both standard and high-def formats. They have posted the entire set of The Face of The Enemy Webisodes (in 720p HD) for free download; this is the first time any BSG webisodes have been available in HD. Also available for free are the catch-up specials. They have bundled a set of “Best Of BSG” eps from past seasons, curated by Ron Moore. In the past, new eps of BSG have appeared on iTunes the morning after first US broadcast. Xbox Live Marketplace: the entire series is on their site, and we are assuming new eps will be there too. If you know something different, speak up. One element that makes us nervous though: as of this morning, they only have 7 of the 10 webisodes posted. Are they going to be slow to keep up with posting new series eps? Amazon VOD: you can watch all of season 4.0 now, and we are assuming you can get new ones starting this weekend. There’s a discount for subscribing for a season pass. Their VOD system allows the following compatibilities: Mac and PC online viewing, Windows PC download, TiVo DVRs, Sony BRAVIA Internet Video Link, compatible portable video devices. Off Topic: I’d like to also put in a plug for another TV show that begins its 3rd season run on NBC Friday night, which is FRIDAY NIGHT LIGHTS. A lot of us FNL fan(atic)s are wondering if this will be the last season for the show because, much like BSG, the ratings have always been kinda low. FNL director/producer Jeffrey Reiner, who directed the CAPRICA pilot, directed several of this season’s best episodes (which just finished running on DirecTV). You can watch the first two seasons online here. For a nice look at some of the reasons you should watch this show, check out Tim Goodman’s piece here about BSG and FNL, and Alan Sepinwall’s piece here.